There are only several steps to take to ensure that your Agency account is properly configured and that you can get the most out of its features. Let's get started! Agency panel is where you can manage all your client Companies and their campaigns. Company panel allows you to run campaigns for your own company, and change any settings (such as Billing Data, and Agency Options). In order to switch between your Company and Agency panels, just expand the menu in the upper-right corner and select “Agency” or “Team“. 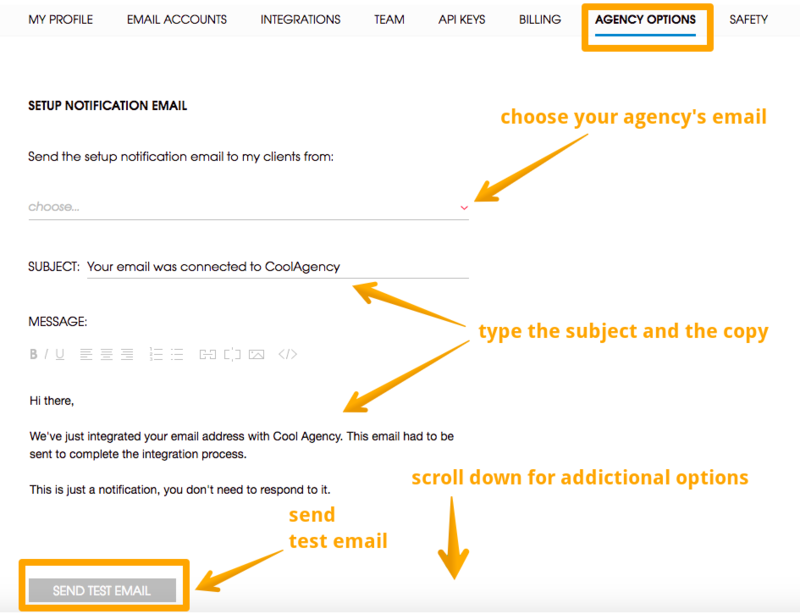 Agency Options is where you can set up email notifiers that will be sent to your clients. You can write any notifier yourself, and don't need to mention using Woodpecker – they are whitelabeled. Custom notifiers are available for connecting a client's email to Woodpecker, sending a user invite, and reminding about invite, if the new user wasn't set up. In your Company panel, navigate to Settings → Agency Options. Select the sender email address (it needs to be connected to Woodpecker), then type in the subject and message for each notifier. Don't forget to click "Save Changes" afterwards! You can review your payments and pricing, and update your Billing Data at any time in your Company panel. Navigate to Settings → Billing. Click "Edit Billing Data" (top-right) to modify what you need, and make sure to have the field "Billing Email" filled out, so that any new invoice is emailed to you. Adding new Users is completely free for Agencies. You are only charged for the Email Accounts in active Companies. Your Dashboard is where you can review all campaigns (for all Companies) scheduled for Today, Tomorrow, and the following days. who manages that company: Owner (5). Expanding (6) an entry gives you a brief overview of all campaigns in that company. To narrow down the list, use filters (7), and filter by To send (e.g. Email #3), or Owner. In this panel, you can see all your Active Companies (at the top), as well as the Inactive ones (at the bottom). Login (6) will take you directly to that company's sub-account. That's where you can modify any settings for that company, update the prospect base, and create or edit any campaigns. You can also filter (7) the entries in the list, and Add a new Company (8) right here. Deactivating a company using the On/Off slider puts all charges for it on hold. When you know that a company will have no running campaigns for at least two weeks, it's a very good idea to deactivate it to save a few gold pieces. You can reactivate that company at any time later. If you'd like to learn more, please check the related articles right below.